Title: Who Better Than Canyon? When Canyon’s ex-lover, Robert, dies, he leaves behind a last request that Canyon take word of his passing to Simon, an old friend on the east coast. Canyon reluctantly agrees, and soon finds himself falling for Simon, despite the nagging belief he shouldn’t, and his guilt over his part in the accident that claimed Robert’s life. Simon knows something Canyon doesn’t — Robert’s death wasn’t an accident, but a suicide, and Robert’s intent was for the two men he left behind to come together. But Robert’s plan didn’t account for two things: Simon’s disbelief that anyone can truly love a soon-to-be-cripple, and Canyon’s staunch decision that the next man he gives himself to will give him a wedding ring first. Can Canyon and Simon set aside their own issues long enough to see what lies between them, or will they both miss out on their happily ever afters? Canyon leaned back in his desk chair with a sigh and rubbed his tired eyes. An online search of Pratt’s Hollow, New York, his destination in two days, hadn’t revealed much. A small coastal town, founded back in the 1600’s by Elijah Pratt — making it one of the oldest cities in the country — it boasted an economy based mostly on agriculture, but at the same time the residents seemed rather proud of the new Target that had moved in two months ago. Front-page news. They did have a tiny airport, though its website didn’t even give any details about what terminal he’d arrive at. At least it wasn’t New York City. 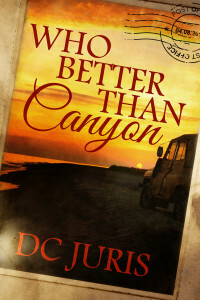 He had no desire to go gallivanting off to the hustle and bustle of a place like that. Canyon sighed. In truth, he had no desire to go gallivanting off anywhere. And who was this Simon, anyhow? What significance did he carry to Robert? What kind of important friend never even called or wrote or visited? And why the hell was it suddenly his responsibility to carry out some assuagement of Robert’s guilty conscience? What if he just said no? Who, beyond Paul and Natalie, would even know or care? Never saying no to Robert had gotten him into this heartache in the first place. Well to hell with Robert. To hell with Paul and Natalie, and whoeverthefuck this guy was he was supposed to go meet. To hell with everyone, for that matter — the family that had turned their backs when he’d come out, the friends who had called him a coward when he hadn’t demanded Robert leave Natalie right away, the other friends who shook their heads and called him pathetic for his stranded little life out here in the middle of nowhere. “To hell with you all,” he whispered. But the words needed more than just a whisper. “You hear me?” Canyon raged, gasping as emotion constricted his chest. “To hell with all of you! I don’t need any of you!” He shoved his chair back from the computer desk, upending it, and rushed to the pantry, grabbing one of the large plastic bags he used for recycling. Slinging the bag in the air to open it, Canyon went from room to room, filling it with Robert’s things. That stupid lumberjack-looking shirt he’d left at Canyon’s two years ago. Three paperback Louis L’Amour westerns. The brown stained coffee mug he’d never allowed Canyon to wash because it was seasoned just right. All of it. Every shred of proof that Robert had even been there. Canyon flung the front door open and trudged out onto the porch, kicking over the flowerpots full of now-wilting pansies that Robert had planted. He tied the bag’s handles together and tossed it out onto the lawn. Let the animals have it. Or the neighbors. Or the garbage man, for all he cared. Halfway back to the door, Canyon stopped. Off in the distance, thunder rumbled. Thunder. Which meant rain. Which meant Robert’s things would get wet. He sighed, shoulders slumped in defeat. Goddamn Robert anyway. Canyon turned and retrieved the bag.